Exciting Escape: Camping at a high altitude lake! The word ‘Camping’ brings to mind images of a warm crackling campfire, roasting marshmallows and scary stories. But there was none of this at our camp, ‘Pangong Serai’ at the Pangong Lake, situated in the Himalayas at an altitude of 14,000 ft.
Our journey to this exquisite lake, a 6 hour drive from Leh, was a difficult, yet memorable one. 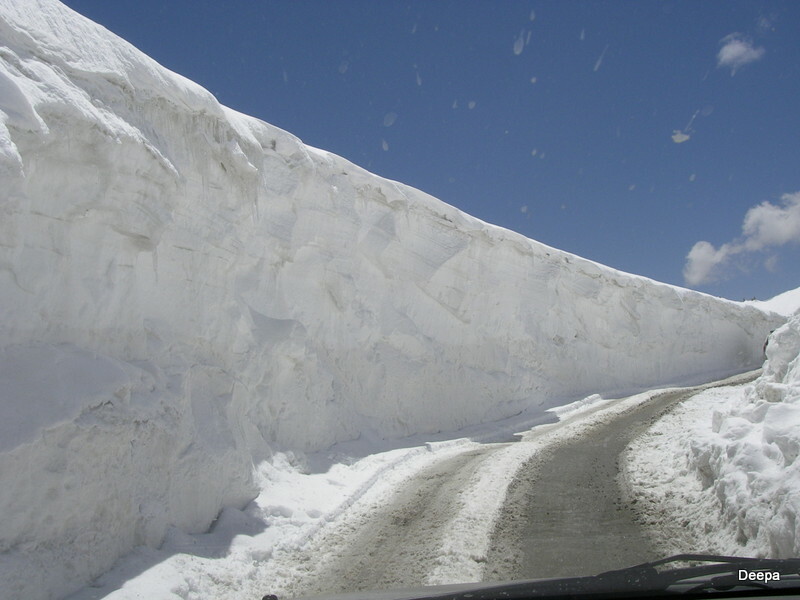 The dramatic and treacherous roads, wedged between walls of snow traverse the Changla Pass, which at 5200 m or 17,000 feet is one of three highest motorable roads in the world. Braving altitude sickness; we stopped here to have a mandatory snack of hot Maggi noodles, a perfect antidote to the icy wind that was blowing. Though it was supposed to be summer, we were freezing in our shoes. We were advised to stop here for not more than 20 mins, and so moved on quickly. From then on, the road dropped steadily, with hair-pin bends and tricky curves through wide valleys. Some of us were sick with nausea, some with headaches and others were tottering somewhere in between! 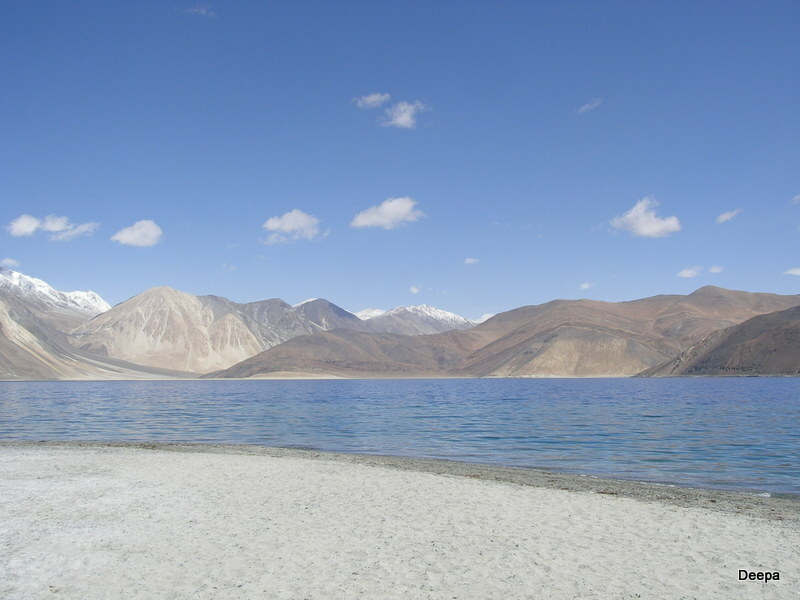 After what seemed like an endless drive, the Pangong Lake bestowed on us, a glimpse of its turquoise blue waters. Serai, so the camp operators didn’t leave any stone unturned in their hospitality! The few who had survived the journey went to explore the place while the rest of us decided to nurse our headaches and migraines. By sunset, strong winds were blowing! All attempts to get a campfire going went in vain as no firewood could be found and the gusty winds weren’t favourable for a campfire too! According to the weather forecast, the temperature would drop below zero for the night. So to insulate us from the cold, we were given 2 quilts that weighed a ton and a hot water bag. The roaring winds shook our tents like waving flags and threatened to blow away our beds. When we asked one of the workers if the tents ever blew away, he replied, “Yes, ma’m, occasionally a tent or 2 does get blown away”. I couldn’t tell if he was joking and I spent the next few hours lying awake in bed trying to come up with strategies in the event of our tent or worse the cots flew away. But I was soon lulled to sleep by the rhythmic rocking of the cots and woke up to a calm and placid morning. The sparkling waters surrounded by striking black-brown mountains created a magical feel, dispelling our travel woes. It was an enchanting sight with the waters changing colour with the changing position of the sun and the stark mountains that looked like a painting in the backdrop. 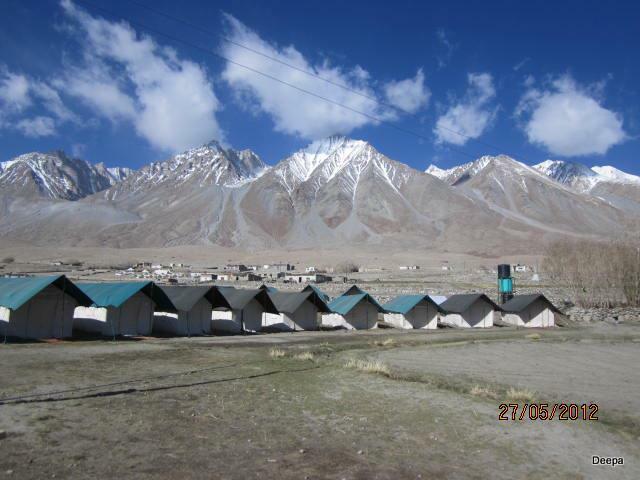 After an extended photo-shoot of the heavenly view of the cerulean waters and mystical mountains, we set out, with heavy hearts, to return to our hotel in Leh. This is one camping trip, I would love to return to, even though there were no marshmallows or campfire or scary stories! Thank you! It is truly an enchanting place! Pangong Lake is magical! It’s like being in a beautiful dream where all I could feel is pure peace and happiness. A once in a lifetime adventure and discovery. Snow in Summer, enchanted mountains , waters that change in colors…unforgettable excitement! Thanks for sharing this amazing journey to the Himalayas. Have a great day my friend.